At Peake Technologies we can attend to all of your ducting needs. Our highly trained team of professionals can bring a wealth of experience to any ducting project. If you have a custom ducting order, we can manufacture it to your exact specifications. 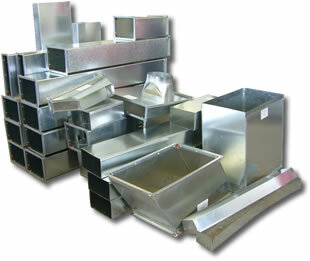 We also supply rectangular ducting and custom made ducting parts for any kind of ducting system. If you can describe it... we can make it! 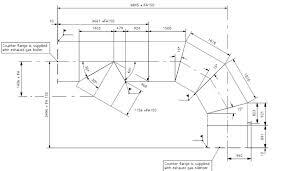 We also offer professional ducting design and consultation services. Peake Technologies manufactures duct work and sheet metal products for any air conditioning and ventilation system. We also do custom designed expansion joints in duct work and fabricated duct work assemblies. Our ducting are available in high grade Zinc-Galvanize or stainless steel. The assemblies may include fabricated elbows, tees, and straight sections of duct work, in carbon steel or stainless steel, and in diameters of 42" or larger. The duct sections can include fabric or metallic expansion joints and can be rectangular or round. In addition, we can provide specialised pipe supports and spring hangers for large diameter duct work.